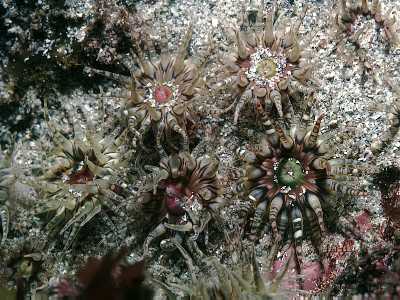 Description: The column of this sea anemone is divided into two regions, a scapus and a capitulum, with a narrow parapet and fosse. The scapus has longitudinal rows of warts. The tentacles arranged in multiples of six, up to 48 (rarely more). The column is pink or grey with darker grey warts, the six principal rows of warts are white. The tentacles are spotted with white or grey and the disc is patterned in various colours, green, red, brownish, etc. Size is up to 25mm across base, tentacle span to 60mm. Reproduces by viviparity. Habitat: Found mostly on the shore in pools or clefts amongst rocks, or attached to bedrock or stones beneath sand. Occasional in the shallow sublittoral, down to 20m. Distribution: A frequent to common species on the south and west coasts of the British Isles, southwest Europe and the Mediterranean. Any records east of Torbay or north of Ireland or the Isle of Man would be welcomed. Similar Species: Few other species have warts on the column apart from Anthopleura spp. and Urticina spp. which can be distinguished by their key characteristics. Warts on column, six principal rows almost invariably white. Never with gravel stuck to the warts. Tentacles arranged in multiples of six. Picton, B.E. & Morrow, C.C. (2016). Aulactinia verrucosa (Pennant, 1777). [In] Encyclopedia of Marine Life of Britain and Ireland.